With so many window options available on the market today in Toronto, it is no wonder homeowners get confused when choosing replacement windows. How can you know what style will be best for your space and lifestyle? Sliders are a popular choice for many reasons. Find out more about these traditional windows, and the modern technology that has made them better than ever. The design is fairly simple. It is a space-saving window where one or more panels open by sliding horizontally. They are similar to double-hung windows, only instead of opening up and down, they open side to side. They are also called gliders, or glider windows. The single slider has one pane fixed and the other slides horizontally. Double tilt slider has two panes that slide and tilt for easy cleaning. Double lift out slider features two sliding panes with recessed finger latches that make it easy to lift and remove sashes for easy, indoor cleaning. Three-lite end vent slider features three lift out sashes ideal for wide openings or multiple window replacements. The tracks make the sliding action smooth and easy. You can open them with just one hand, using only your fingertips if you like. As long as you maintain the window, you shouldn’t have any trouble opening it. You can clean glass from inside your home. No need for climbing out on the roof or using rickety ladders. They are also easy to clean and maintain. There are no cranks or other hardware you need to worry about. So your windows not only take little work but are more durable. These windows do not project over outside walkways or patios. They also don’t open into the house, taking up valuable room. Because they slide, they take up no extra space when open for ventilation. Slider windows also offer up spectacular views, much larger than double-hung windows. As such, they also let in more natural light and make rooms appear larger. You might not know this, but siding windows are more energy efficient than other styles. Because there are not complicated, moving parts it is easy to close them tightly and firmly every time. You can also choose energy efficient glass that combines low-E coatings with different argon gas between the panes for insulation. This will help keep your home warmer in the winter, cooler in the summer, and cut down on your energy bills. 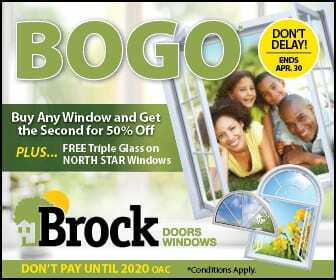 Call Brock Doors and Windows Today! Are you interested in getting slider windows in Toronto installed , or just want to learn more about our products? Call today! Our knowledgeable staff and installers provide only top quality service. You can reach us at (416) 324-2604 or stop by 2131 McCowan Rd., Scarborough, ON M1S 3Y6 to get a firsthand look at our products.